Thursday: My sister is having a baby! We’ll grab dinner with my mom at St. David’s or nearby, probably. This entry was posted in Meal Plans, Weekly. Bookmark the permalink. We have fennel coming, too. I don’t like fennel. Maybe I will try your potato-fennel soup in hopes of it masking the licorice flavor. 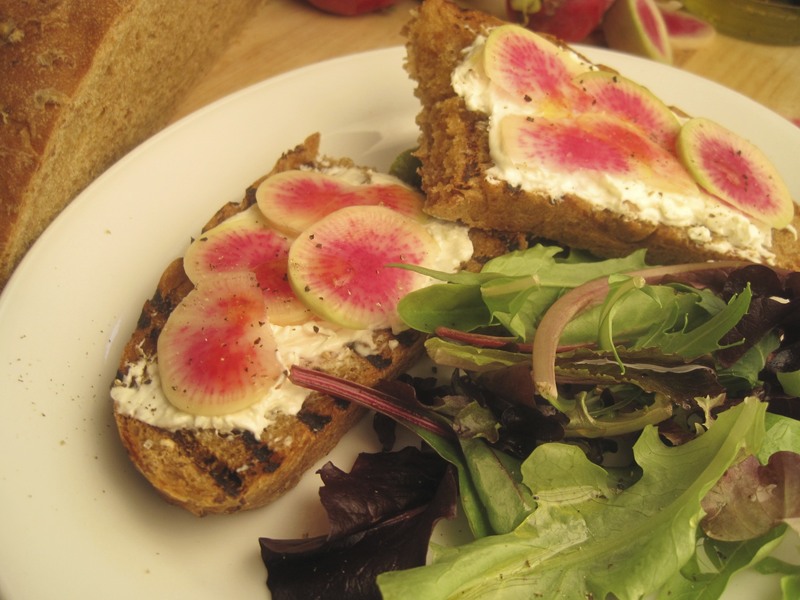 The radish tartines were OUT OF THIS WORLD. If you guys haven’t tried them already, I would definitely recommend them. I am guessing you are an aunt today! Congrats! I am can’t wait to see chard frittata, yum. All of that sounds amazing! I met you at the Bleet-Up over a month ago, and just found your business card. I’ll be reading from now on, though! Hope you have a wonderful weekend.